I’m still out of town so all my picks this week are e-books from the library’s digital catalogue. I have to say, I’ve been really impressed by the variety of titles available this way (the catalogue is expanding daily), especially since many of the books available digitally aren’t available from the library in hard copy. It will be nice to be home next week and have access to the real library again but I certainly don’t feel hard done by without it! 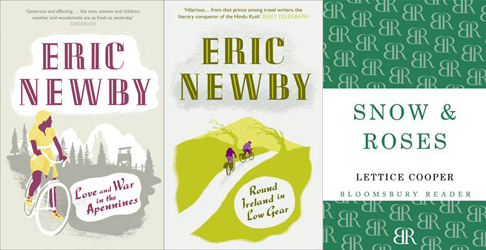 Love and War in the Apennines by Eric Newby – I’ve lamented for years how limited my library’s collection of travel writer Eric Newby’s books is. Wonderfully, they now have his books available through the e-book catalogue so I can finally read Love and War in the Apennines, about Newby’s experiences during the Second World War. Round Ireland in Low Gear by Eric Newby – another chance to enjoy the digital library’s Newby collection! Flora is a young Oxford lecturer, whose love affair with a married man has ended in tragedy. She faces a bleak, empty world. Following an ill-fated flight to a villa in Tuscany, and the collapse of her warm friendship with Lalage, an Oxford colleague, Flora is close to breakdown. She is rescued by her understanding family and by her return to Oxford, where she finds release from her own emotional problems in those of her most brilliant student, Nan, who seems about to sacrifice her career on the alter of revolutionary politics. Lettice Cooper explores and illuminates the varied contrasts of generations, classes and beliefs, and is equally absorbing in the smaller world of university rivalries and gossip, or the hot-house jealousies and intrigues in an Italian villa. Above all, this book illuminates the personality of a young woman at a crisis in her life. How I Live Now by Meg Rosoff – I just found out that a film adaptation of this book is set to be released later this year and that seemed like reason enough to pull it out for a reread. 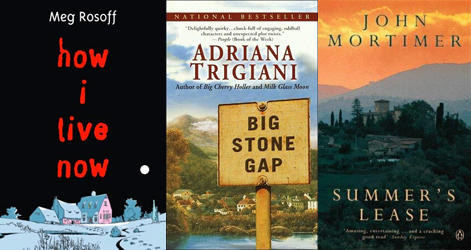 Big Stone Gap by Adriana Trigiani – It’s 1978, and Ave Maria Mulligan is the thirty-five-year-old self-proclaimed spinster of Big Stone Gap, a sleepy hamlet in the Blue Ridge Mountains of Virginia. She’s also the local pharmacist, the co-captain of the Rescue Squad, and the director of The Trail of the Lonesome Pine, the town’s long-running Outdoor Drama. Ave Maria is content with her life of doing errands and negotiating small details-until she discovers a skeleton in her family’s formerly tidy closet that completely unravels her quiet, conventional life. Suddenly, she finds herself juggling two marriage proposals, conducting a no-holds-barred family feud, planning a life-changing journey to the Old Country, and helping her best friend, the high-school band director, design a halftime show to dazzle Elizabeth Taylor, the violet-eyed Hollywood movie star who’s coming through town on a campaign stump with her husband, senatorial candidate John Warner. Summer’s Lease by John Mortimer – The villa near a small Tuscan town is everything the Pargeter family could want for three weeks. But when the idyll turns sour, Molly Pargeter begins to wonder about their mysterious absentee landlord. Just added an early post to this week and a late post to last week’s loot! I am hoping to go to Melbourne shortly so its making lists again time. Your books are included. That’s one advantage to an ereader. Always being able to get another book as long as you have an internet connection. Enjoy! I loved Summer’s Lease when I read it when it was first published, and it was also made into a TV serial, if my memory serves me correctly. This week I have picked up the latest from the pen of Judith Lennox (the title momentarily escapes me … it’s in the next room and I’m too lazy to fetch it! ), plus The Talisman Ring by dear old Georgette Heyer, and I have a couple of delicious brand new, hot off the press books for which I will be interviewing the authors (one on interiors, one on gardens), oh, and Carol Thatcher’s autobiog. So lots of new things being added to the TBR pile! I have How I Live Now on my tbr pile. Golly, it’s been there for years! Thanks for the heads up on the film adaptation. I will read it before then as well. Hope you enjoy it.. 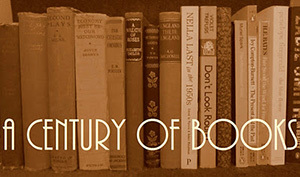 I know it’s a favorite among readers. Hi there! Just wrote a blog post and linked to the site. I get almost all my books as e-books and I can walk to the library! I’m just sooooo lazy. Oooh, I love your loot this week! And – you answered a lingering question for me. I have been trying to remember the title of Summer’s Lease for a few weeks now and you’ve solved my mystery. I really liked the tv adaptation of it and have long wanted to read it – thank you! Thanks for posting about Big Stone Gap!